Moving quickly to fill the presidency of the Pontifical Council for the Family, this morning the Pope named Cardinal Ennio Antonelli of Florence to the post. While some speculation had predicted the consolidation of the Family shop into the Pontifical Council for the Laity, the appointment keeping the former a stand-alone entity comes but six weeks -- i.e. a Vatican minute -- after the death at 72 of Cardinal Alfonso Lopez Trujillo, who led the dicastery since 1990. Even so, however, those expecting the 71 year-old appointee to continue in the mold of his oft-controversial predecessor might be in for a surprise. In contrast to the Columbian cardinal -- a favorite of church conservatives who became a globally-known figure for his high-profile polemics on abortion, homosexuality and HIV/AIDS -- Antonelli's long enjoyed a reputation as one of the Italian church's gentler, more moderate hands. A onetime professor and seminary rector, the trained theologian, classicist and art historian served as a diocesan bishop for 12 years before being named in 1995 to the powerful post of secretary-general of the Italian episcopal conference, the CEI. 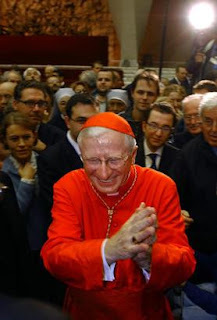 On Cardinal Silvio Piovanelli's retirement six years later, he was named archbishop of Florence, receiving the red hat at the consistory of 2003. Before the 2005 conclave that elected Benedict XVI, the cardinal's name emerged as papabile from circles seeking a "pastoral" successor to John Paul II. Even more recently, a series of pastoral schema on family life released by the Florence archdiocese focused much more intently on issues of the "fear of definitive choices," "relational fragility" in families, and even the "post-sacramental exodus" of the faithful than anything that'd fall into what the pontiff himself once termed the "collection of prohibitions." In a late 2005 profile, Catholic News Service highlighted Antonelli's love of the arts alongside an "optimistic pastoral approach and his strong social teachings." As a member of the pontifical councils for Social Communications and for the Laity, Cardinal Antonelli puts special emphasis on the role of lay people in the church. As in most European cities, church attendance in Florence is relatively low, but he said the small number of "active and responsible faithful" who get personally involved in the life of the church is on the rise. "This phenomenon is unexpected" but is "a sign of a providential rebirth," he said in a December interview with the Italian daily, Il Tempo. In the midst of the secularization that has taken hold across most of Europe, the cardinal praised Catholics who "pay splendid witness to prayer, charity, helping the poor, education, missionary courage and Christian joy." "They make up a bright and credible sign of the presence of Christ the savior," he told the newspaper Toscana Oggi in a recent interview. In the world of politics, the cardinal lamented the lack of political representation that fully reflects a Christian agenda. Though "politics is about mediation and compromise" and "one can never be fully satisfied" in getting what one wants, "the Christian today may find himself in great difficulty because his vision of society is not fully promoted by either the major or minor political parties," he told Il Tempo. Cardinal Antonelli, like most Italian bishops, was an outspoken critic of the U.S.-led invasion of Iraq, which the Italian government supported. When the war began in March 2003, he and the bishops of Italy's Tuscany region issued a statement expressing their sadness and their disappointment that Pope John Paul II's repeated appeals against the war were ignored. Cardinal Antonelli asked all the churches in his archdiocese to toll their bells in mourning the first night of the war and said his own opposition to military action in Iraq was "convinced, firm and passionate." He invited people to come to a church in the center of the city and pray the rosary for peace with him and encouraged them to continue demonstrating their opposition to the war "in the squares and the churches, with our body and souls." Before the conclave, the National Catholic Reporter similarly cited the cardinal's "terrific relations with his people" and "lack of interest in cracking heads over doctrinal issues," using as an example Italian elections during the 1990s when some wings of the national church sought hierarchical rebukes for divorced Catholic politicians. Comparing the Florentine prelate to John Paul I along the way, the mag's John Allen wrote that Antonelli "took the view that personal morality belongs to the private sphere, and that in terms of politics, the church should be more concerned with a politician's voting record." In a statement released this morning on his appointment, the incoming Family Czar said he approached his new position "fully aware of the importance" of the task ahead. Calling the family "the cellular base of the church and society... strongly respected at the level of ideals and first among the aspirations of the Italian people," Antonelli added that the institution also finds itself "in great difficulty, threatened, and in crisis." Later, in an afternoon interview with Vatican Radio, the cardinal defined the principal challenges to the family as "the unity, the stability of matrimony, and the fruitfulness of couples," explaining the latter as the "demographic fall [that]... above all in Europe, places the future at risk." Asked why the church's "yes" to the family is often interpreted as a "no," the cardinal said that, "ever more in its language," the church needed to "present the Evangelical, positive prospect of the family: its great values, the beauty of the family [as] Christian and also authentically human. "Above all, the positive needs to stand out," he said. "Ahead of, above and more than some 'no's, counts the 'yes' -- the great 'yes' to life, the great 'yes' to the dignity of the person, the great 'yes' to communion among the people who form a family." The cardinal closed the chat by praising his predecessor as someone with a "great passion for the family" who, he said, had the "courage to not fear unpopularity." Scheduled to leave Florence in late September to take up his new duties in Rome, Antonelli's first major turn on the global church's stage will come in early January, when the 6th World Meeting of Families takes place in Mexico City. The Pope is expected to attend.